Description: Perennial plant, grows to 0, 6 meters. Flowers from June to September. Flowers are furrowed, orange to scarlet red in color. Parts used: Roots, leaves, flowers. Herb can be used fresh during its growing season, or dried flowers during flowering period. Medicinal use: As the name suggests, (voulneraria means wound healer) the plant was traditionally used to promote wound healing. 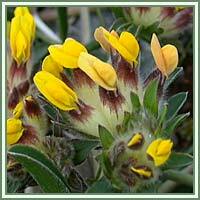 It helps the process of skin regeneration, acts as a remedy for skin eruptions, slow healing wounds, cuts and bruises. 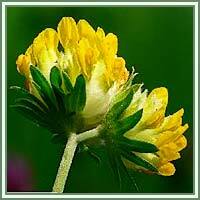 Used internally, Kidney Vetch has a laxative effect, helping in cases of constipation.